You should have seen our garage the first week we moved in to Old Salt Farm. Oh, the boxes. Piles everywhere! Within a week, everything had been sorted, and the “garage stuff” was on shelves. And there it sat, all through the winter, until now–when I was ready to get it organized for summer. 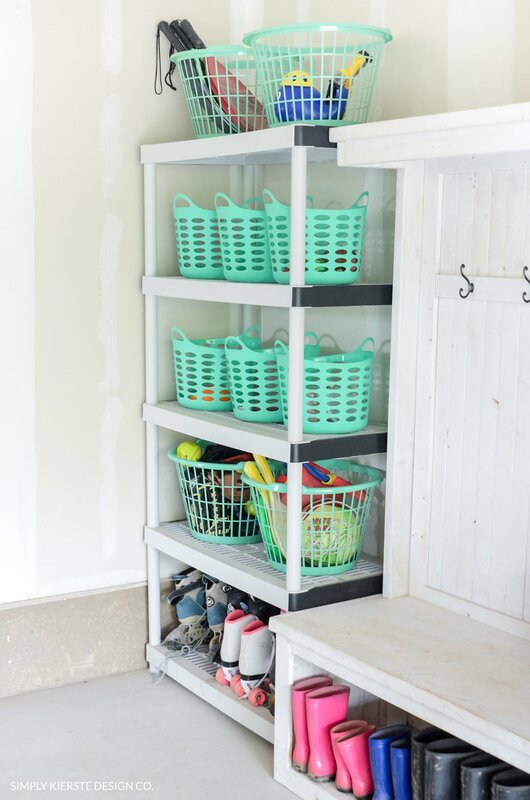 I went out shopping for baskets and bins, but I was on a budget, and I didn’t want to spend a lot for baskets that were going to be in the garage. I headed to The Dollar Tree, and there I found exactly what I was looking for. $10 later, I had the baskets I needed to organize the shelf with all off my kids’ outdoor toys. Success! 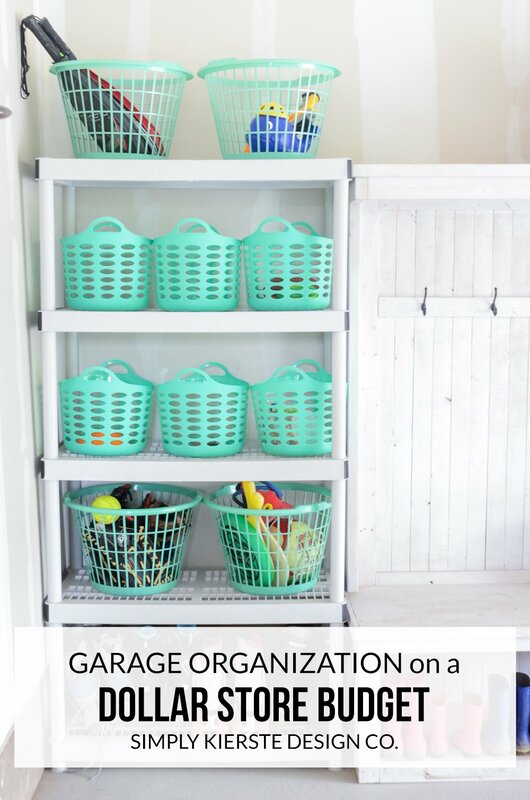 Garage Organization on a Dollar Store Budget! This post contains affiliate links! Full disclosure here. I was so excited to get different baskets, but all in the same color. There were a bunch of different colors to choose from, and types of baskets, and I went back and forth on a couple before I finally settled on these. I wanted different sizes–smaller ones for things like sidewalk chalk and bubbles, but larger ones for baseball mitts and racquetball rackets. At a dollar each, I only spent $10 to fill these entire shelving unit! I LOVE bargains! I would have spent around $10 per basket, if I had gotten them anywhere else. They were only $1 each, so they’re probably not going to last forever, but even if I get two years out of them, it’s totally worth it. 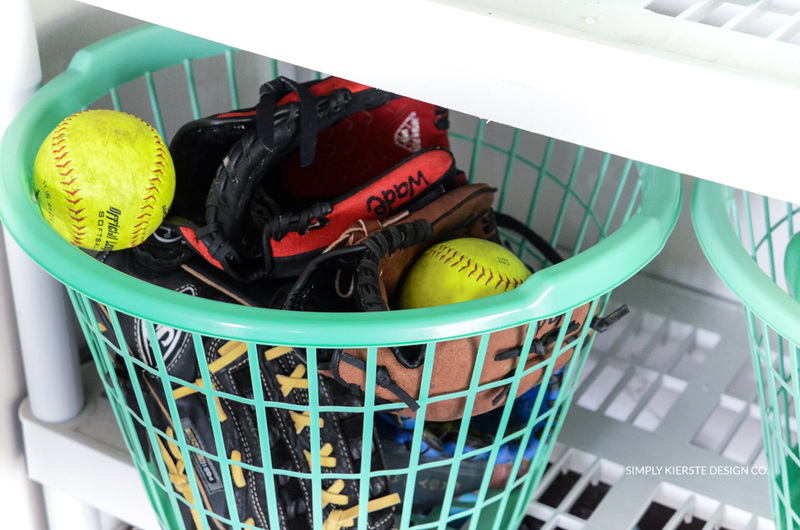 Plus, I don’t want expensive baskets in my garage! As I was organizing, I did take out all of the balls that were on the shelves. They didn’t fit really well, and took up way too much room, so it opened up a lot more space for everything else. I now have them hanging on the garage wall, and they’re perfect there. 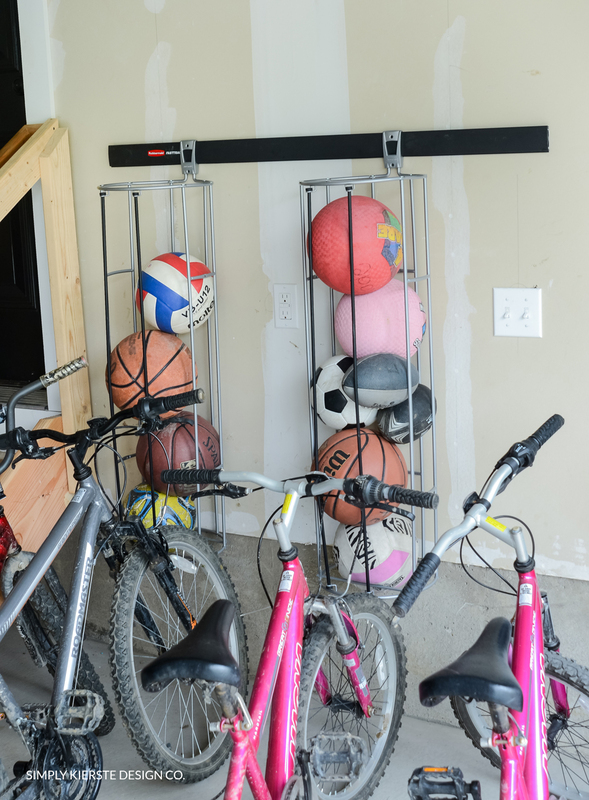 We installed the Rubbermaid FastTrack system and Ball Rack–definitely not from the dollar store, but we love it, and found it totally worth it! And if that white bench looks familiar, we actually built it years ago for our Texas house! I didn’t have room for it in this house, but it fits perfectly along this wall in the garage, next to the garage door. All of our muck boots in the summer and snow boots in the winter go on the bottom shelf. The hooks are perfect for umbrellas, snow pants, and more. I love it. 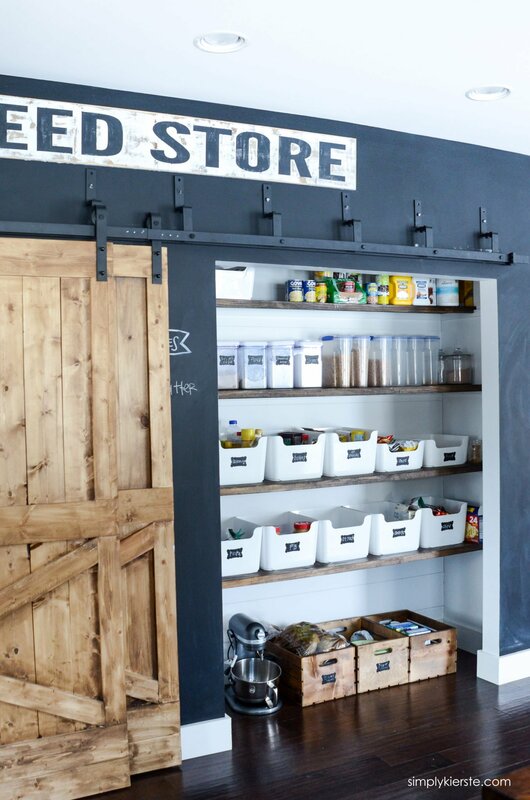 I’m so excited for garage organization…and on a dollar store budget! Very nice! I love that the baskets work well, and look great! And that they are inexpensive. Thanks for sharing! Thank you! Inexpensive and cute is the best combo. :) And you are so welcome!! Thanks for sharing. Looks so fresh. Great idea! Where is the white shelvings unit from? Is that Rubbermaid too?